Dr. Rizzi reviews the indications for performing a urinalysis, the 3 methods for collecting urine—with a step-by-step guide to cystocentesis, proper handling techniques, and evaluation of a sample’s physical appearance and specific gravity. 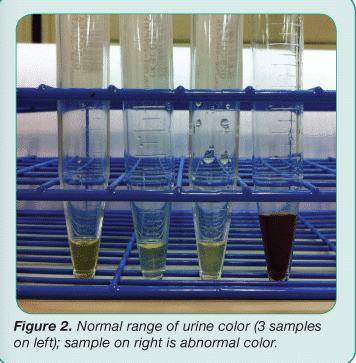 Urinalysis (UA) provides information about the urinary system as well as other body systems. It is usually performed in-clinic rather than being sent to an outside laboratory, which is why it is important for the veterinary team to be able to effectively evaluate a complete UA. The UA is designed to provide information needed to pursue a particular clinical problem or as part of a health screen. Therefore, it is usually included as part of the minimum database of diagnostic tests, along with a complete blood count (CBC) and clinical biochemistry profile. Free-catch samples are easy to obtain. Urine should be collected in a clean container with a tight fitting lid that is available from medical supply companies (Figure 1). Discourage owners from using containers from home, which may contain contaminants, such as detergent, food, and medications, that may alter chemistry results. 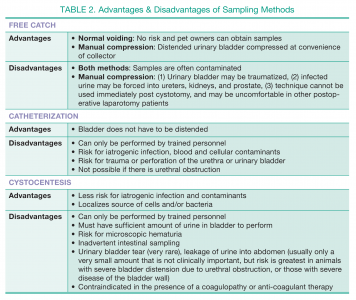 Samples can be obtained via normal voiding or by manual compression of the urinary bladder. A mid-stream sample is preferred. The disadvantage of a voided free-catch sample is potential contamination with cells, bacteria, and debris from the distal urethra, genital tract, and external skin. 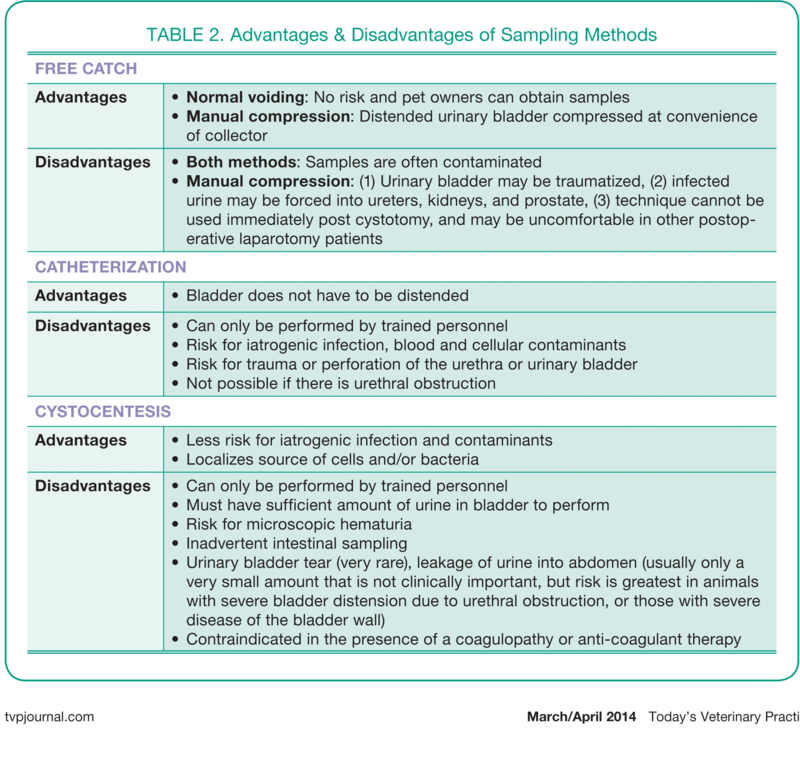 Free-catch samples that are positive for white cells, bacteria, and protein will necessitate sampling via cystocentesis (or catheter) in small animal patients. Catheterization of the urinary bladder is performed using a sterile urinary catheter; the external genital area and distal urethral opening are aseptically prepared; however, contamination of the sample may still occur. In addition, catheterization may cause iatrogenic urinary tract infections by introducing bacteria into the urinary bladder, and is more likely to add red cells and transitional cells to the sample due to mild trauma that results as the catheter passes through the urethra. Cystocentesis of the urinary bladder is generally easy to perform in small animals. It is the preferred method of urine collection when evaluating the significance of cells or bacteria in the urine or obtaining urine for culture. Mild blood contamination may be seen in cystocentesis-obtained urine samples. Although urine leak or hemorrhage is possible following cystocentesis, the incidence of these complications is exceedingly rare and should not deter the practitioner from performing cystocentesis in the vast majority of patients. See Step-by-Step: Cystocentesis—Bladder Isolation Technique. Assemble equipment and attach needle to syringe. Restrain the animal in lateral recumbency. In some dogs, the bladder may be easily palpated while standing. Palpate the urinary bladder, located in the caudal abdomen, to determine if bladder contains enough urine. Clean the caudal abdomen skin with ethanol. Gently isolate the bladder between the fingers of one hand. Once the bladder is isolated, insert the needle without applying negative pressure, at an approximate 45-degree angle. At the appropriate depth, slowly draw back the syringe plunger to aspirate the desired volume of urine. When the desired volume of urine is obtained, release the syringe plunger and withdraw the needle. Restrain the animal in dorsal or lateral recumbency and spray the caudal abdomen skin with ethanol. Apply the ultrasound transducer to the surface of the abdomen and visualize the urinary bladder. While visualizing the urinary bladder, insert the needle as previously described to aspirate the desired volume of urine. Once a sample is collected, UA should be performed within the hour to avoid artifactual changes that occur as cells and casts deteriorate. If the urine cannot be examined within that time, or will be shipped to a laboratory, the lid should be tightly secured and the sample refrigerated to slow the rate of artifactual changes. Refrigerated and sealed samples are valid up to approximately 6 hours. 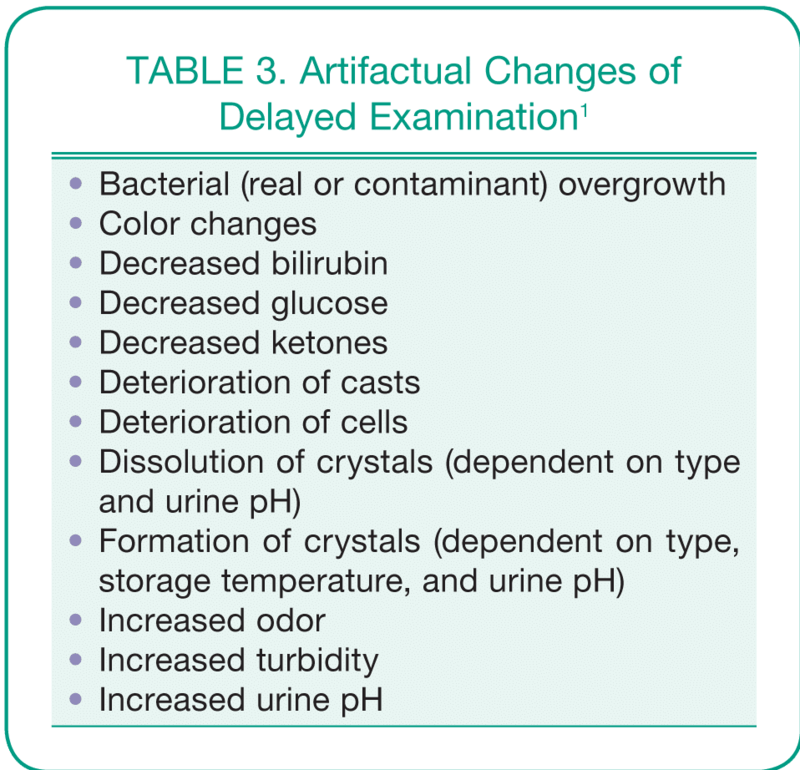 Most laboratories suggest shipping the sample with a cold pack to delay onset of artifactual changes (Table 3). Shipped to an outside laboratory for biochemical analysis or cytologic examination should contain several mLs of urine sent in a clean, secured collection container for routine biochemical analysis and sediment evaluation, or in an EDTA tube for cytologic evaluation of the the sediment. Alternately, an air-dried slide of sediment can be sent for staining and evaluation by a veterinary clinical pathologist if suspected cellular atypia is present. Shipped for culture should be obtained by cystocentesis, which is the preferred method. Samples obtained via mid-stream free catch or aseptic catheterization are acceptable if a quantitative culture is performed so that contamination can be ruled out. When urine is obtained by cystocentesis, the needle should be changed before placing the urine in a vacuum tube. Most laboratories prefer at least 1 mL of urine sent in a sterile red top tube with an accompanying cold pack to keep the sample cool. Bacterial proliferation occurs in urine stored at room temperature, thus urine should be refrigerated until shipped. EDTA preserves cell morphology, which is particularly important since cells deteriorate rapidly in urine, and will prevent clotting in samples containing blood. It also has bacteriostatic properties that inhibit bacterial overgrowth in samples containing bacteria. Microscopic examination of urine sediment. 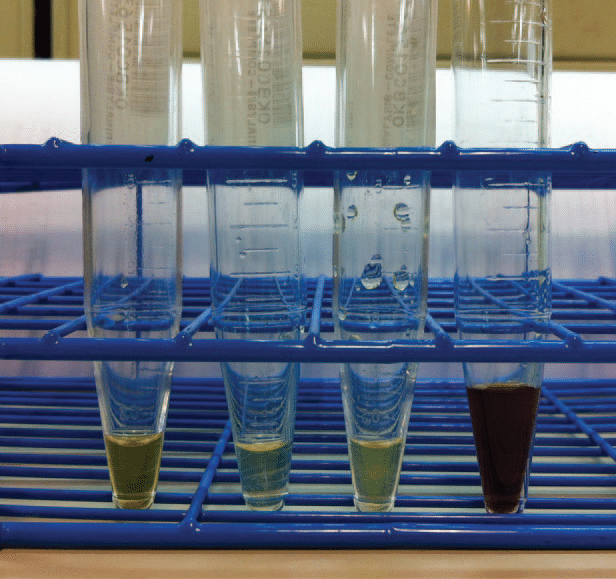 Part 1 of this article will discuss evaluation of the sample’s physical appearance and USG, while Part 2, which will be published in the next issue of Today’s Veterinary Practice, will address evaluation of urine chemistry and sediment. 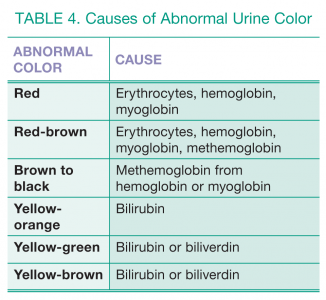 The normal color of urine is pale yellow, yellow, or amber (Figure 2). 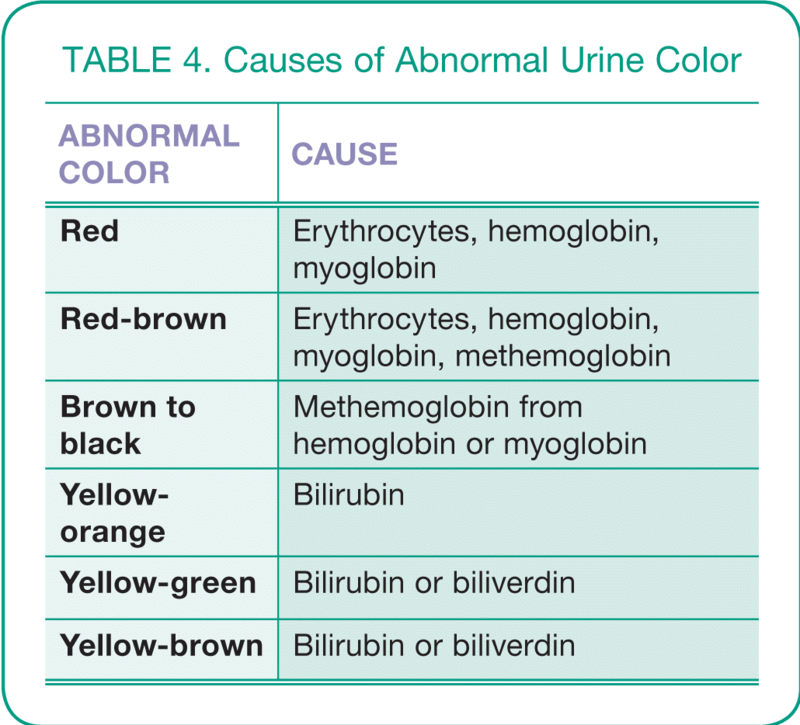 Abnormal urine color may be the reason clients seek veterinary attention for their pets (Table 4). There are many reasons for abnormal urine color, including issues related to diet, medications, and the pet’s environment. It is important to recognize that pigmenturia may interfere with the color change results on the urine chemistry reagent strip test pads. Urine is typically clear. Cloudy urine samples may be caused by suspended material, including cells, crystals, bacteria, lipids, and mucus. Causes of turbidity can be further investigated by examining the urine sediment under a microscope, which will be discussed in part 2 of this article. USG indicates the solute concentration of the urine, and is an indicator of the kidneys’ ability to concentrate or dilute urine, providing valuable information about one of the kidneys’ primary functions. 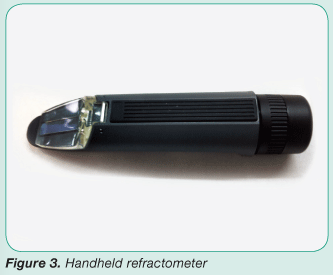 USG is measured by a refractometer (Figure 3). 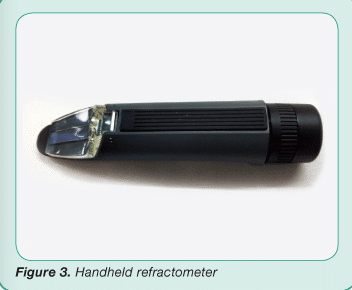 Refractometers are calibrated for the species being tested and many types are available, including digital refractometers. A drop of urine is placed on the glass under the plastic cover; then held up to a light source while the examiner looks through the eyepiece. USG is recorded at the light/dark interface on the scale visualized through the eyepiece. When complete, it is important to wipe the glass without scratching the surface. Scratches on the glass may interfere with USG reading and invalidate results. Administration of fluids and/or medications. 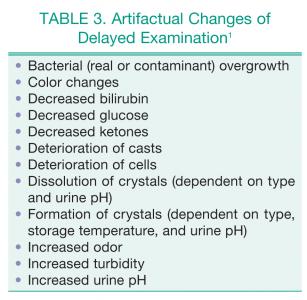 Several clinical entities may also alter the kidneys’ ability to concentrate urine (Table 5). 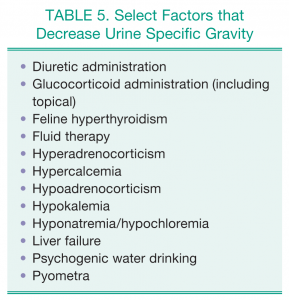 Hyposthenuria (USG < 1.007) is dilute urine, indicating a specific gravity lower than plasma and glomerular filtrate. Isosthenuria (USG 1.008–1.012) indicates a specific gravity equal to plasma and glomerular filtrate. 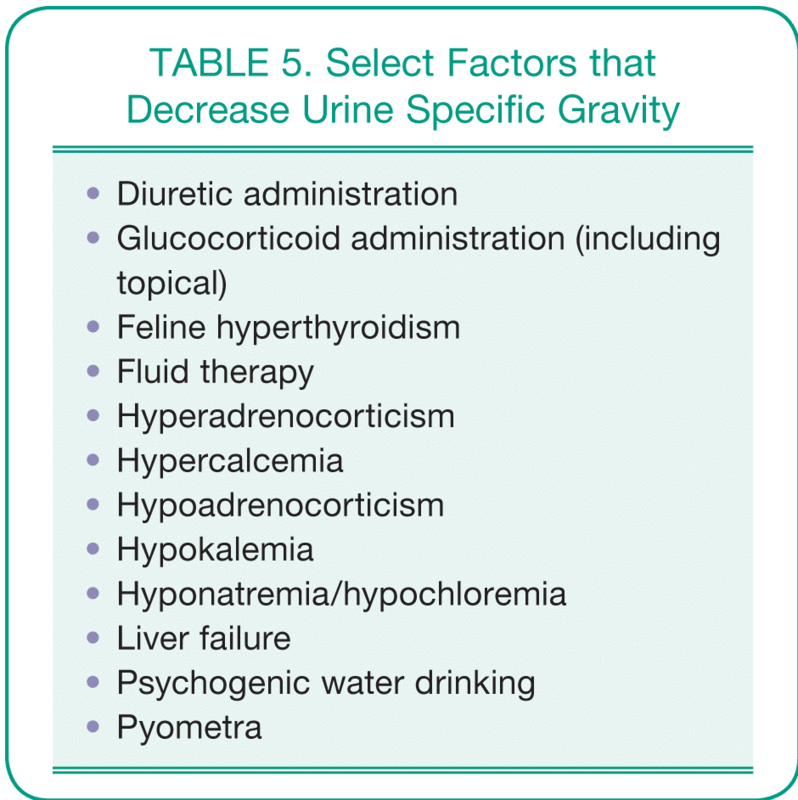 A dehydrated animal with healthy kidney function should excrete a small amount of highly concentrated urine, increasing the USG. If the USG indicates isosthenuria (USG < 1.030 in a dog and < 1.035 in a cat), a detailed history to determine recent medication administration and evaluation of serum creatinine and urea nitrogen concentrations are indicated. “Normal” reference intervals for USG may be misleading since there are many variables that contribute to USG. Therefore, the interpretation of USG is always based on the clinical status of the patient and consideration of factors that are known to alter USG. Osborne CA, Stevens JB. 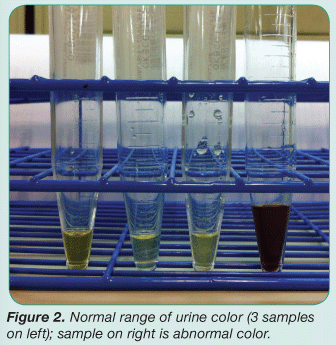 Biochemical analysis of urine: Indications, methods, interpretation. urine sediment: Under the microscope. Urinalysis: A Clinical Guide to Compassionate Patient Care. Pittsburgh: Bayer Corporation, 1999, pp 58, 105-140. Chew DJ, DiBartola SP. Sample handling, preparation, and analysis. Interpretation of Canine and Feline Urinalysis. Wilmington, DE: Ralston Purina Company Clinical Handbook Series, 1998, p 10. Stockham S, Scott M. Urinary. Fundamentals of Veterinary Clinical Pathology, 2nd ed. Ames, Iowa: Blackwell Publishing, 2008. pp 463-473. 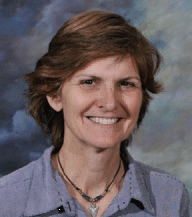 Theresa E. Rizzi, DVM, Diplomate ACVP (Clinical Pathology), is a clinical associate professor at Oklahoma State University’s Center for Veterinary Health Sciences. 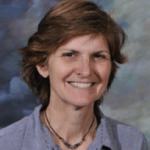 Her clinical interests include cytauxzoon infection in cats, hematology, and diagnostic cytology. Dr. Rizzi teaches select classes in the clinical pathology core curriculum.